It’s been 15 years, but the mother of a local teenage firefighter, who died in a tragic car accident back in 2003, says she still carries her son close in her heart. And an upcoming fundraiser to benefit the new fire hall build will be a special way to celebrate him, she said, because 19-year-old Brian McKay’s dream had been to spend his life fighting fires. However, in Grade 12 Brian shockingly died in a single vehicle accident, never finishing high school, said his mom. But the local fire department has not forgotten that keen young firefighter, who was being mentored and trained for a future role with the force. Now that the municipality is moving forward with plans to build a new, larger, and more modern fire hall this year on South Railway Street, McKay was thrilled to help out, after coming up with the idea of next month’s Bobbin’ for Brian Indoor Fishing Derby, to be held at the Shamrock Centre on Saturday, February 16. Now the McKay family and the fire department are putting the fish and the firemen together – in a very fun way – to celebrate Brian’s life, and to raise cash for the new fire hall. Plus you don’t have to know a thing about how to fish. Fifty ‘fishing holes,’ represented by buckets, will be spread out in the middle of the hall, and people will then walk around, and drop their ‘lures’ into the ‘holes,’ she said. A few changes have since been made to make it run a little faster, and more fun, she said. Tickets are $20 for adults, and $10 for students, and are available at Lewis & Jones, Gwen’s Trends, the Co-op Gas Bar, and from organizers and Debbie McKay herself, dispatcher for Wawanesa-Belmont Transfer, located in Suite #4 at the back of the MAFRI and Services for Seniors offices on South Railway. Deadline for advance tickets is Saturday, February 9. “Organizers will be in the Killarney Place mall on Friday and Saturday, February 8 and 9, from 10 a.m. until 4 p.m., to sell tickets,” said McKay. Registration begins at 5:30 p.m. on Saturday, February 16, and the derby begins at 7 p.m., and runs until 10 p.m. Prizes totalling $1,250, plus other wins, will follow. McKay hopes that the event will inspire other youngsters to become future firefighters for the municipality. GREEN RIBBON IN MEMORY OF BRIAN – Fire Chief Troy Cuvelier (left), of the Killarney-Turtle Mountain Fire Department, and Debbie McKay (right), mother of late firefighter Brian McKay, a Grade 12 student at Killarney School who died in 2003, posed by the fire department’s rescue van. 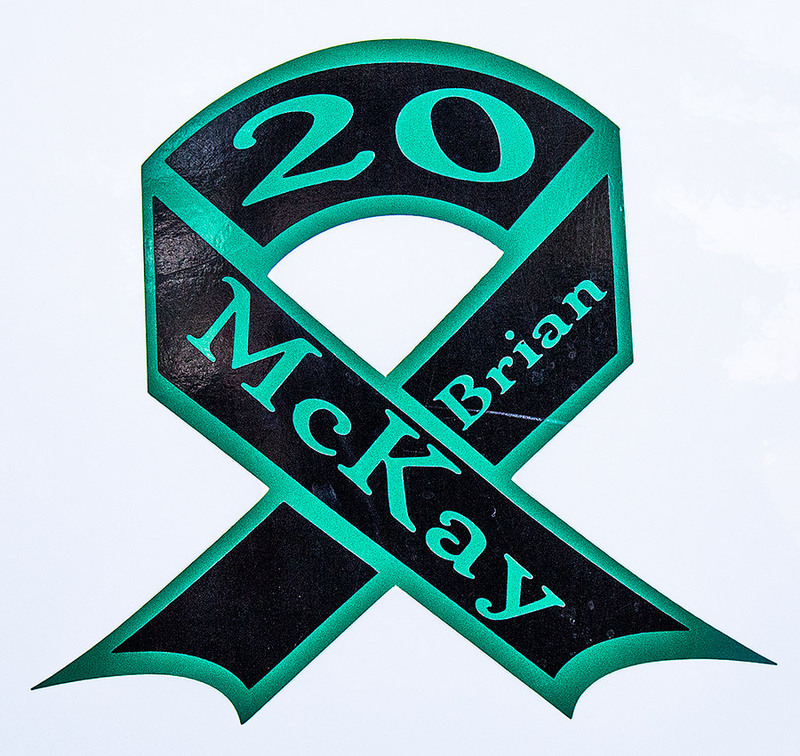 Between them is the commemorative green ribbon on the van that bear’s Brian’s name, and the number 20 for his helmet number (see below for detail). He also loved fishing – so an indoor fundraising derby coming up next month will help pay for the community’s new fire hall. FIREFIGHTER ATTIRE – The local firefighters took to wearing a smart uniform white shirt, beginning back in Fire Chief Mike Bellew’s time, says Debbie McKay. 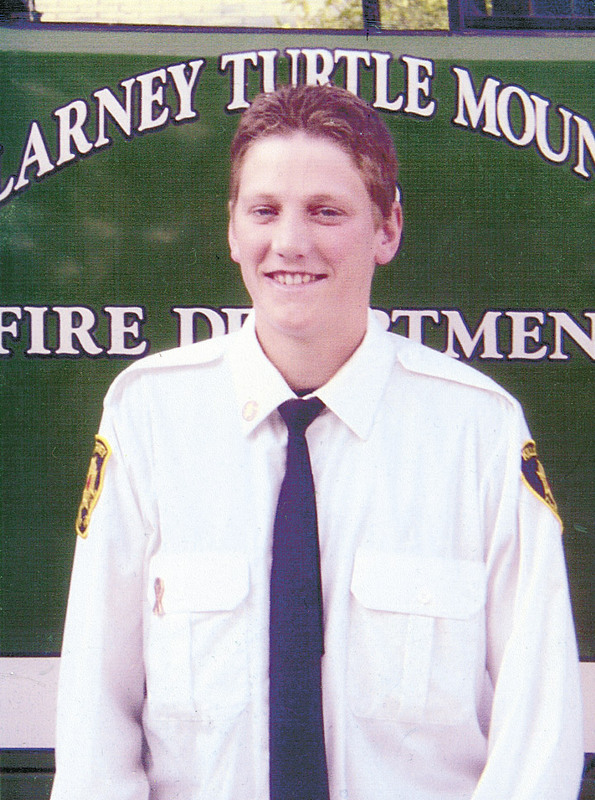 Here’s her son Brian back in 2003 wearing his, while serving in the community in a non-emergency capacity. 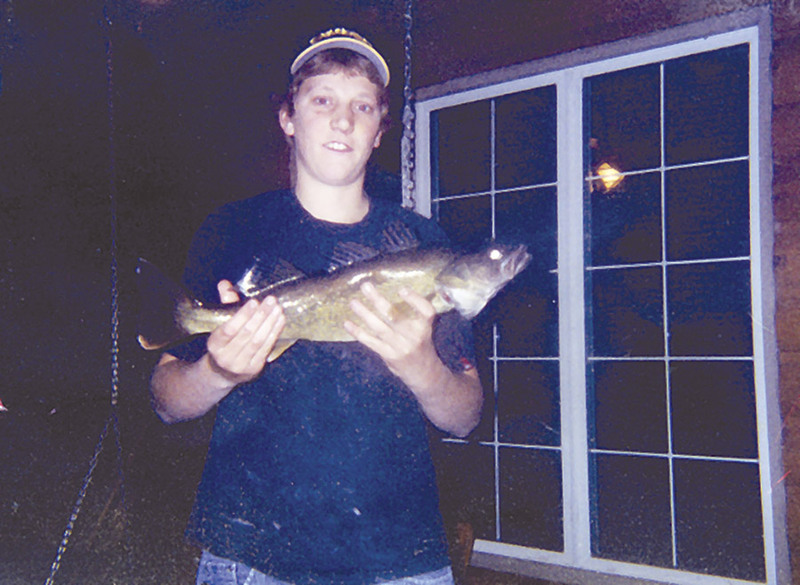 THE LAST FISH – Two days before his untimely death following a car accident in 2003, 19-year-old Brian McKay was out fishing on the lake, and caught this whopper. His mother snapped the photo and captured the joyous moment, which now hangs framed on her wall.